As you may know, Volkswagen has acknowledged including software in their diesel cars that cheats emission tests. The admission (after being busted by the U.S. Environmental Protection Agency) may cost the company $30 billion in fines. It already has damaged the brand’s reputation among consumers and VW dealers. In today’s economies, a person is motivated to do whatever he can get away with to obtain as much of your money as possible. That’s how wealth is built in today’s system. So it should be no surprise that at some point a car maker would use technology to build “smart cars” capable of fooling smog tests. Every company faces similar temptations. What keeps this kind of thing from happening in Copiosis? People get rich in Copiosis doing the right thing only. Our algorithm ensures producers are rewarded for making people and the planet better off. If you make people, the planet or both worse off, you get nothing. Not only that, if you try to do such a thing, and you’re public about it (even among your small team), it is unlikely anyone will want to work with you because word will get out. Why? Because preventing someone from making the planet and people worse off merits a reward too. Unlike money, rewards people get in Copiosis are non-transferrable. That means a boss can’t compel you through financial threats or incentives to get you to do something you don’t think is right. First, there are no bosses like there are today, who have authority over things like when you work, how long you should work, what your tasks are, or how you should behave. Secondly those who are leading teams aren’t responsible for financial rewards their team members receive. The leader can’t therefore threaten to fire you, or make a morally questionable task more palatable by increasing your salary or paying you a bonus. There are no regulatory agencies to bribe or pay off. Regulatory capture didn’t play a role in the Volkswagen scandal, yet we know it is pernicious in many countries. Wherever government enforces regulation, there’s the threat that the regulatory agency can be bought. In Copiosis there is no government, so there’s no such thing as regulatory capture. There is no money, so there are no bribes worth talking about. The people responsible for ensuring other people do the right thing are as numerous, passionate and dispersed, as the citizenry itself because they are your neighbors, friends, and fellow citizens. Everyone operates according to stigmergy, making it very difficult to predict where whistle blowers might lurk. Since anyone in Copiosis is a potential whistle blower and all whistle blowers are rewarded (if their claims are proven), the risk of being caught doing something bad is high. In modern societies, it’s hard to do anything without cooperation. In Copiosis nearly everything requires multiple people cooperating to get things done. Severe penalties await those who are caught collaborating to do things that hurt the planet and people. Who metes out such penalties? Your fellow community members. There are plenty of examples today where such shunning can be severe indeed, making it hard for the offender to keep a job, find a new one, or even feel comfortable in their community. Here’s one example. Here’s another. There’s no reason to cheat in the first place. Cheating happens as a shortcut to what is wanted. 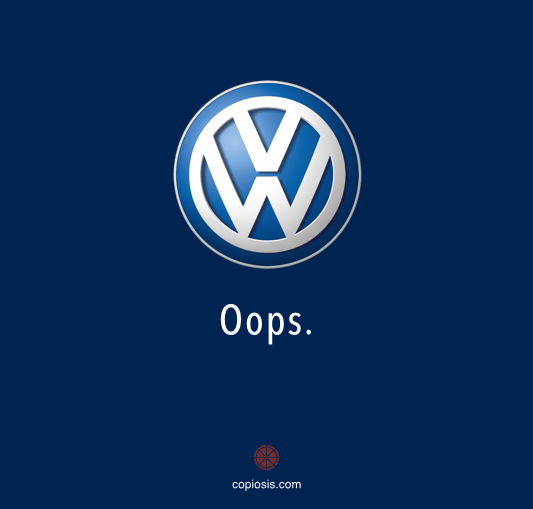 Perhaps Volkswagen managers thought they could get away with it. Investigations are underway. Maybe they were under unrealistic product requirement pressures and knew they couldn’t meet without cheating. In today’s economy, breaking the rules often means big rewards, so long as you’re not caught. In Copiosis there are no incentives to cheat. Why cheat when it’s just as easy to build products (all capital goods are provided to you at no cost) that work, that last, that satisfy consumers and protect the planet? That’s how you get rich in Copiosis.